11/26/2018: Completed Tasks 1, 2 and 4. I will more than likely skip Task 3. 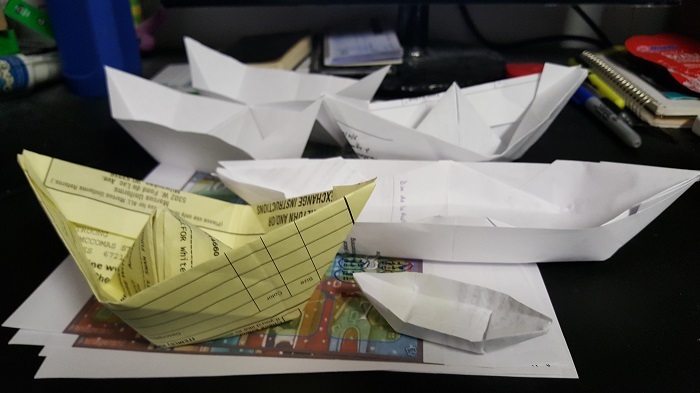 It's been a very long time since I folded boats. This is something I used to do with my mom and aunts when I was younger--folding origami to pass the time. My folding skills aren't what they used to be. I used to be extremely precise about my folds, making sure every edge was perfectly aligned, and ever fold pressed and pressed and creased, over and again. I don't really remember how to make all of these, so had to look up the other ones. So here is my rather flimsy fleet. If you’ve ever attended a procession or an event involving festively decked out boats, post a picture and tell us about it. Unfortunately, this is something I don't recall ever having done. 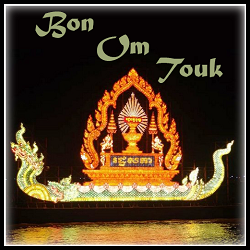 Bon Om Touk celebrates the end of the rainy season. Tell us: What’s your favorite type of rainy day book – and do you have a favorite drink or snack to go with your rainy day reading? Photos welcome! I can read just about anything, rain or shine. But going hand-in-hand with my comfort reads, I suppose picking up an exciting Romantic Suspense is always a great rainy day read for me. Meanwhile, tea and some sort of sweet makes a wonderful rainy day reading snack. Barring that, sometimes I like cheese and crackers. Which are your 3 favorite books where a key character is “moonlighting”? 1. Discount Armageddon by Seanan McGuire // Verity Price -- a bar cocktail waitress who moonlights as a cryptozoologist, hunter, and ballroom dancer! Read a book that takes place at sea or on a river OR with water on the cover OR where the plot involves a festival or the moon plays a pivotal role in the plot. This may require a bit of searching, unless any of the books I plan on reading will end up fitting.